Whoo-ee, do I love free shipping. In my case, of course, I missed the UPS van on Friday, so that meant I had to wait until Monday to tuck into the Lucid. Having now strolled down the newly-paved legal absinthe lane, I have to say I’m pretty pleased. I’ll leave the detailed breakdowns to those with more learned palates than mine — there are plenty of those over at the Wormwood Society, should you be looking — but in my modest experience, I’d say Lucid is a very good quality absinthe. As a big fan of Jade’s Edouard and Nouvelle-Orleans absinthes, I had expectations that were perhaps too high for the product, but still, Lucid managed to please me on a number of fronts. As mentioned in its press materials, the herbal aspect of Lucid has been recalibrated for the U.S. market — which means it has a less robust anise presence than do the Jades or most other quality absinthes I’ve tried (and thanks to WS events, I’ve tried some very pleasant ones), but it has a well-balanced complexity that blows the doors off of many more moderate quality brands, not to mention any absinthe substitute on the market (and if your sole experience with absinthe is from trying something like Hill’s or King of Spirits, be prepared to wet yourself with pleasure from trying an absinthe that’s not only palatable, but damn enjoyable). True, Lucid isn’t the end-all and be-all of absinthes, and I find it a bit milder in flavor than I’d prefer, but for a first product to hit the U.S. market, it’s pretty damn good. (And apparently I’m not the only one who feels that way; DrinkUpNY, which has the free shipping offer, is now out of stock until late July). One of the biggest reasons I was eager to have Lucid in the house is because, being a cocktail geek, I needed a more reasonably priced absinthe to try in a few old timey cocktails. Prior to this week, the only ones I had on hand were Combier Blanchette and Jade Edouard, and while I’ve grown accustomed to using the Edouard as a rinse for my Sazeracs, there’s no way I’m pouring an ounce of my $150 bottle of booze into an experimental cocktail. 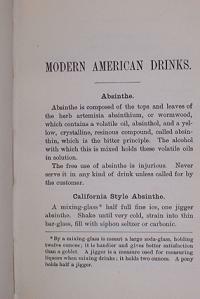 The free use of absinthe is injurious. Never serve it in any kind of drink unless called for by the customer. Look — here’s me, calling. Put into a thin eight-ounce glass containing a few lumps of clear ice one pony [one ounce] of absinthe, two dashes maraschino, four dashes anisette. Slowly fill the glass with ice-water, stir well with long barspoon. Serve. So, a drip with some ice and a little flavoring. To be completely honest, it doesn’t taste all that different from your average absinthe drip — though that’s not a bad thing. There’s maybe a touch more funkiness and a bit stronger anise note than you’d usually have, but that’s about it. Still, considering that an absinthe drip is a lovely thing to behold, and a little funky exoticism is a good thing in the middle of the week, the Absinthe, Italian style may make a return engagement in these parts. Oddly enough the absinthe is still sitting underneath my desk at work. I am trying to creatively think of a way to create a drip, but I am not thinking I’ll rush into this. 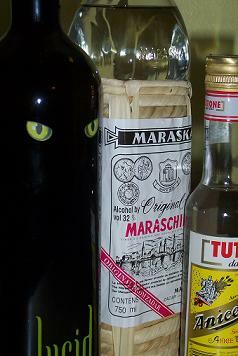 How do you replicate a ‘dash’ of maraschino? BTW – thank you for the bar recommendations, but it’s hard to stray from the ZZ knowing it is as good as it is. I’ll probably venture to them in a couple of weeks. Once the novelty of legal absinthe wears off, and with the flux of other absinthes flooding the market, I wonder how long until we get a $40 absinthe? Then, it’s true affordable absinthe cocktails 24/7!! I’m truly jealous of your Kappelar. It is one of two books I need to complete my collection. The other? Harry Johnson, of course. Some day, some day. I thought it was passable as an every-day drinker; its the one to serve guests. Overall, a bit pedestrian and reminiscent of the best Spanish absentas, with a bit less overt anise. Still, its pretty amazing to witness what one ambitious man (and a bunch of geeks on a website) accomplished in 10 years. I will buy it just to support the cause (and serve it to those I may have wasted Duplais on). as far as i know about the revival of green fairy, i suggest to try this line of absinthe. Artemisia Collection offer the unique original new contemporary Absinthe recipes blend one with Spicy Chocolates and the other with finest Arabic Coffee, which are most delicious Elixirs of the World Absinthe revival. This Cocktail was created to give a touch of magic to women who love cocktails well made. It consists to pouring in a small cup Martini 2 parts of Artemisia Spicy Chocolate Absinthe and a orange liquor. Method: shake vigorously and serve it in medium Martini cup.